Grocery is so hot right now. Just a year after Amazon’s acquisition of Whole Foods, the fight to own the future of one of the largest consumer industries is just getting started. Having been working to innovate on behalf for shoppers for the past five years, I’ve seen a lot change in the industry over the past few years. Above all else, the death of in-store local grocery has been widely exaggerated by Amazon CEO Jeff Bezos and every venture capital-subsidized delivery company thriving in Silicon Valley. And across the rest of the country, Americans aren’t buying the doomsayer’s hype. In the past two weeks, I had two very different grocery shopping experiences that I think are indicative of how this battle will begin to heat up as more and more players jump in. The first was at the IDDBA (International Dairy Deli Bakery Association) Conference in New Orleans. For three days, over 12,000 people poured into the Convention Center to work their way through 2,200 booths showing the latest and greatest of their trade. From cheeses to charcuterie, milk to yogurt, prepared salads to sandwich display cases, everything you could possibly think of from your last trip to a local grocery store’s “fresh” section was represented. But it wasn’t just the grocery products that were accessible, there were the people, the creators, who were present and could tell you everything you could possibly need to know about each piece of cheese, each piece of meat, each confection. This was their livelihood, their lifetime of work, and they were bringing their best to the show and to their partners across the country. The second experience I had was in Seattle at the Amazon Go store, which promotes that you “enter the store, take the products you want, and go!” with their checkout-free shopping. I downloaded the app, scanned myself in through the turnstile, and proceeded to pick out a sandwich and soda and walk back out of the store. No one in the bright orange Amazon polos said “hello” to me, or made eye contact with me as they restocked the shelves. There was no verification that my payment had gone through and I left the store feeling like I’d just gotten away with shoplifting while the shopkeeper was in the back room. Eventually I got an email letting me know my purchase had gone through and the app updated to reflect the same. It was a seamless experience, but one that made me realize how much I associated my food purchases with a human experience. 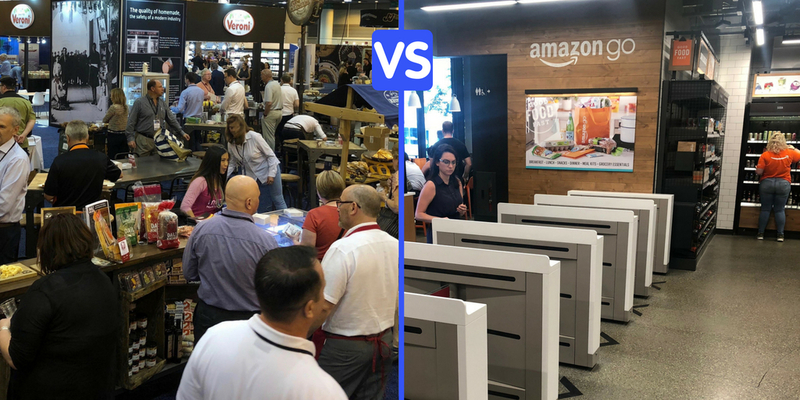 Based on these two experiences, I believe that local grocery stores have a tremendous opportunity to fight back against the online grocers and delivery services that have dominated the grocery news for the past year. While a lot of items that come in bags, boxes, cans or jars are truly commodities that don’t require any skill to pick out, the rest of the grocery store is an experience that still matters to shoppers across the nation. In recent conversations with local shoppers that have tried online grocers and delivery services, they’ve shared that they are only ordering things from the “inner aisles” of their local grocery stores — those items that are conducive for sitting on your porch for hours — but are still going into the store to get their meat, seafood, produce, frozen and dairy products. Even those people that have been early adopters of the curb-side pick-up craze, that I believe will dominate future innovation headlines for retailers in local grocery, are tending to do pick-up for these boxed or bagged items, and then still go into a real brick and mortar store to select their fresh produce and meats. While innovation is coming to the mostly antiquated grocery industry, the complexities surrounding grocery products’ creation, packaging, presentation, storage and ultimate sale are more profound than any other consumer industry that has been transformed by technology. As a result, the early solutions may span the gamut, from the cashierless grab-n-go to the more human-centric community hub. I predict that the real long-term ‘winners’ in the grocery battle will succeed by building a more personalized shopping experience that focuses on accessibility, transparency and choice. The choice to pay more for the convenience of delivery or curb-side pick up right next to the choice to save money by going into the store and participating in loyalty promotions. Giving the shopper the power to make the right decision for themselves each time is the future of grocery. Andy Ellwood is the Co-founder and President of Basket, the world’s largest shopper-powered grocery platform. He is also a start-up advisor, angel investor and entrepreneurship advocate.